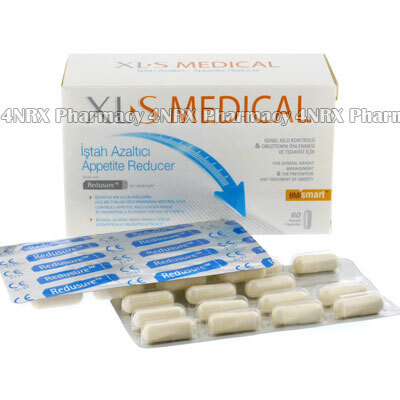 What is XLS Medical Appetite Reducer used for? XLS Medical Appetite Reducer is an oral supplement used to aid weight loss by preventing feelings of hunger. It is normally prescribed along with regular exercise and a balanced diet to provide a better eating schedule and prevent excessive snacking. This action can prevent the formation of new fat deposits by reducing food intake while allowing existing deposits to be reduced through exercise lowering the risk of heart disease or other similar cardiac conditions. Your physician may prescribe it to be used along with other medications or for the treatment of other unlisted conditions, as well. How should I use XLS Medical Appetite Reducer? XLS Medical Appetite Reducer should be taken according to your physician's instructions and those included with the packaging to get the safest and most effective results from treatment. The normal dosage is three capsules taken before a meal or between meals to prevent snacking or overeating. These should be swallowed whole and unaltered with a large glass of water. Do not split or crush the tablets before use as this may weaken or alter its effects. Always ask your physician any questions you have about the medicine to ensure the correct usage. What are the side effects of XLS Medical Appetite Reducer? XLS Medical Appetite Reducer will not cause side effects in most patients. Stop using the medication and contact your physician as soon as possible if any serious symptoms occur including severe indigestion, diarrhea, vomiting, faintness, or signs of an allergic reaction such as hives, skin rashes, swelling, or trouble breathing. These conditions may require lower doses, reduced application frequency, or immediate medical attention to prevent further health complications from occurring. Strictly follow all instructions provided to you by your physician or pharmacist while using XLS Medical Appetite Reducer. Optimum and safe dosage can differ based on the patient and the condition being treated.